The ceremony marking the first Wisconsin Central Airlines flight at Madison. Margaret "Mickey" Morey, the wife of Howard Morey, is about to cut the ribbon. She is standing beside J.C. Higgins, president of the airlines. Wisconsin Central originated in Clintonville in 1944, but moved its headquarters to Madison in 1948 when the Air Force gave up its lease at Truax Field. 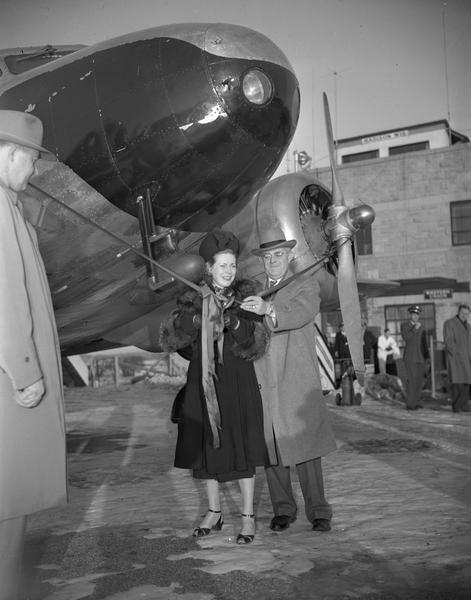 Howard Morey became president of the airline after it moved to Minneapolis in 1952.